Everyone is usually blown away by the Taj Mahal and its love story, even though it's more morbid than romantic since it's a mausoleum where the Emperor and his beautiful Empress are buried. Shah Jahan is remembered more for this legacy than the terror he inflicted as a Mughal Emperor, transforming the empire into a military machine and demanding more revenue from the peasantry. However, the arts — music, crafts, architecture — did flourish under his rule. 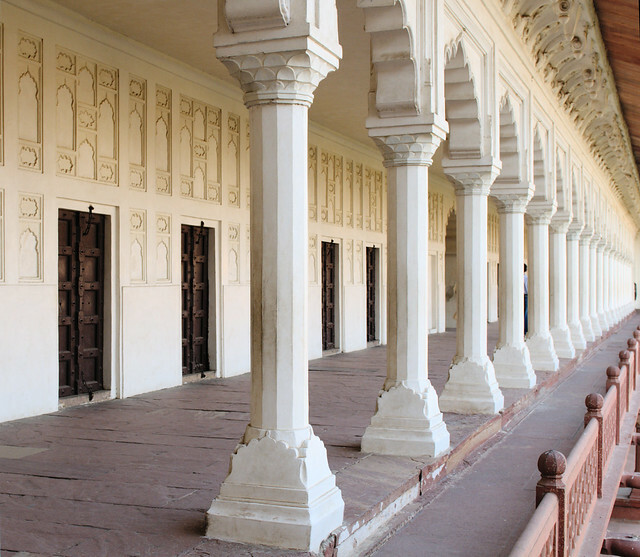 I was more awed by the Agra Fort for its sheer history: it was the seat of the Mughal Empire for over two hundred years from the mid-1500s. 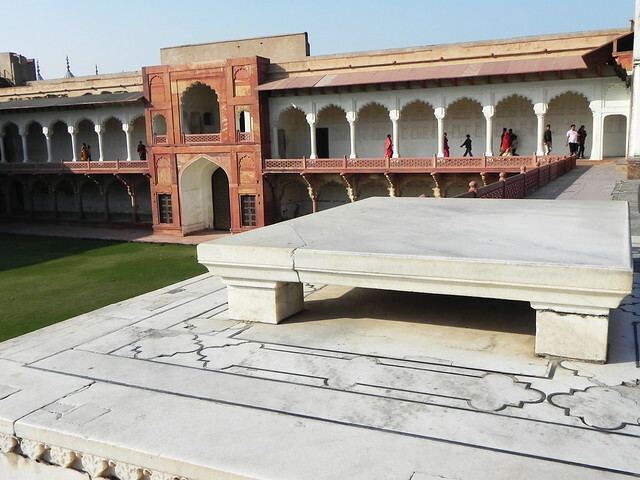 Six Mughal Emperors ruled from there — Babur, Humayun, Akbar, Jahangir, Shah Jahan and Aurangzeb — with each one adding his distinctive mark to the architecture of the fort. 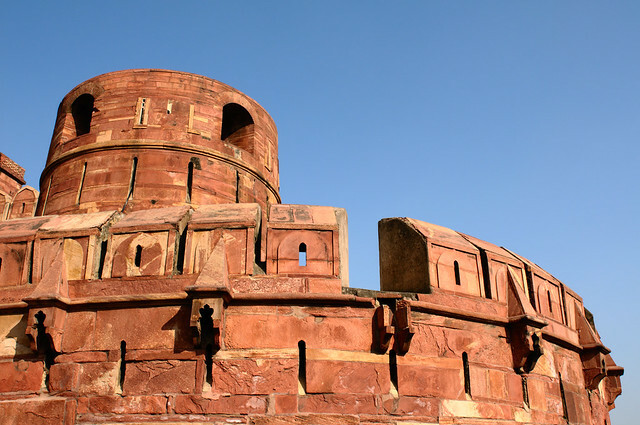 Built mostly in red sandstone, the fort was said to have over 500 buildings built in the design of Bengali and Gujarati (Hindu) architecture; some of these were destroyed by Shah Jahan to make room for his white marble palace, others were pillaged and reduced to rubble by the British when they rode in. 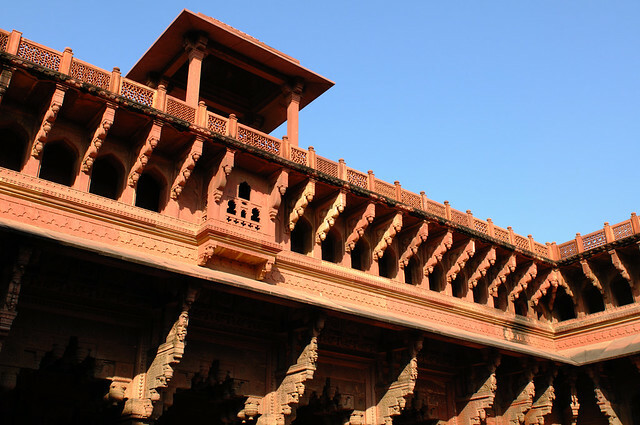 There were winter palaces and summer palaces that were built strategically to harness the warmth of the sun and the cool of the red sandstone. My mind was close to exploding as I marveled at the intricate designs on the walls, the long corridors lined by arches, the use of water to cool rooms and startling use of hidden yet open vents for ventilation. We waited our turn to sit on Akbar's seat in the Deewan-e-Khas, where he held private audiences with his ministers and advisors. There wasn't as much of a rush for Birbal's seat, which was right across from the Emperor's. The photo ops were greater across the courtyard and that suited us just fine as we are fans of Birbal and his logical mind. The green lawns in the quadrangle behind Birbal's seat used to be the Emperor's private fishing pond. 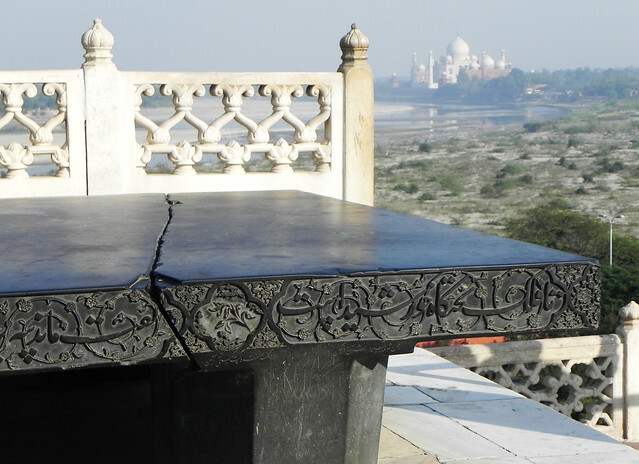 Birbal sat here; and so did we! 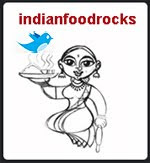 The Mughals brought with them their love of the arts and fine cuisine. Mughlai cuisine can be traced to its roots in Persia and central Asia, with abundant use of dried fruits and nuts, aromatics and mild spices. It blended well with the local and regional flavors, leading to its current avatar from creamily lavish to very spicy. For me, that means diving into biryanis and kebabs. I make all sorts of kebabs — these Persian-inspired lamb kebabs are a huge hit — but I've never been able to get my marinade to cling to the meat in a tight embrace. Neither butter nor thick cream ever managed to give me the texture that I found on Mughlai kebabs, especially the ones I gorged on in Agra. Until I found my answer in my copy of J. Inder Singh Kalra's Prashad, Cooking with Indian Masters: besan! It gives the marinade a silky texture and ensures an even coating on the skewered meat, that doesn't drip off as soon as heat is factored into the equation. Blend together yogurt, cilantro, mint, ginger, garlic, black pepper, cumin, mace, cardamom, chilli powder, turmeric powder and lemon juice. Stir in besan, making sure there are no lumps. Add oil and salt. This is your marinade. Taste it to make sure it is a little salty and tangy. Wash and pat dry chicken tenderloins. Cut each tenderloin into 4 bite size pieces. Add the chicken to the marinade and refrigerate for about 2-3 hours. Skewer the marinated chicken pieces about an inch apart and place them on a tray to collect any drippings. Roast for 8-10 minutes, basting at least twice with melted butter. I prefer to roast them for about 5-6 minutes and then broil them on high for another 5-6 minutes. If you like charred edges, roast a minute or two longer under the broiler, keeping a close watch. 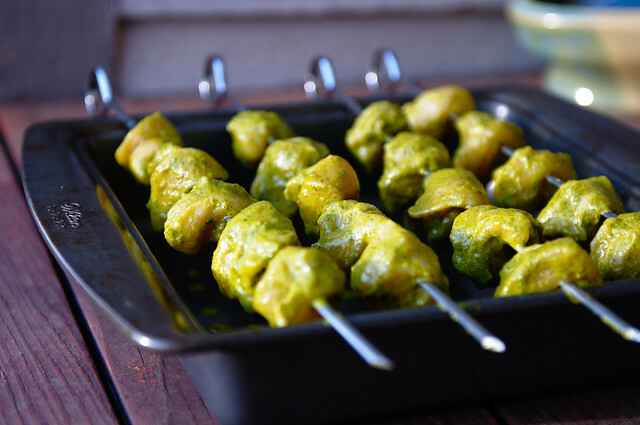 Take the tikkas off the hot skewers and serve immediately. I use 1/2 cup yogurt and keep half the marinade aside for a quick stove-top chicken with onions and tomatoes, a few days later. Or I make more tikkas. I end up using most of the marinade this way. Do not skimp on basting with butter as that seals in the juices, giving you very succulent kebabs. I don't char mine as much as I prefer them to be tender and cooked just right, rather than over-cooked. These work well at summer cookouts, roasted on charcoal grills. I'm looking forward to doing that this summer! The cookbook suggests roasting them for about 8-10 minutes, basting once, if cooked on a charcoal grill. If you don't have metal skewers, buy wooden skewers and make sure you soak them in water for a good half hour or so before using. 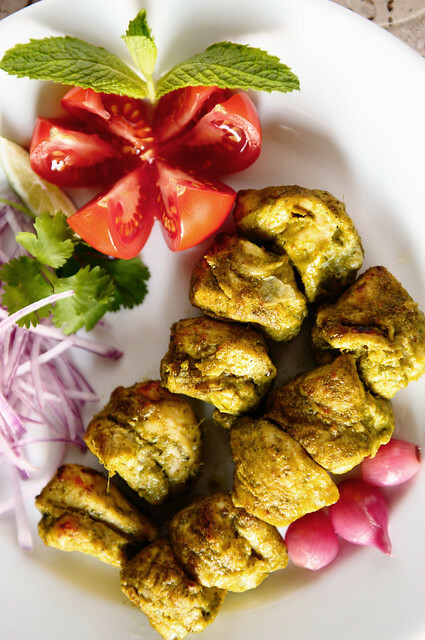 This is a twist on the regular chicken tikka where cilantro and mint add the hara or green ingredients to the kebab. These tikkas are great as hors d'oevres with a cocktail or three. Agra looks amazing. India in on my to do list! I've got to go there sometime. Do you think this marinade would work well with tempeh or tofu? Beautiful Pictures!!! and crisp writing... somehow my Agra trip has'nt happened but I am craving to visit. Ohh!! and the kababs look yummilicious..... so good that I have been salivating looking at the pictures. Those tikkas look amazing! And I love your idea of using up the marinade in a chicken dish a couple of days later. I have to do that next time around! Those are some excellent photographs !! Don't know when we can visit. Really want to this time, but will be too much and too hot. Love hari tikka!! Your photos make me want to pick up some. I make mine similar but without the besan. What does the besan do here? Make the marinade stick more? 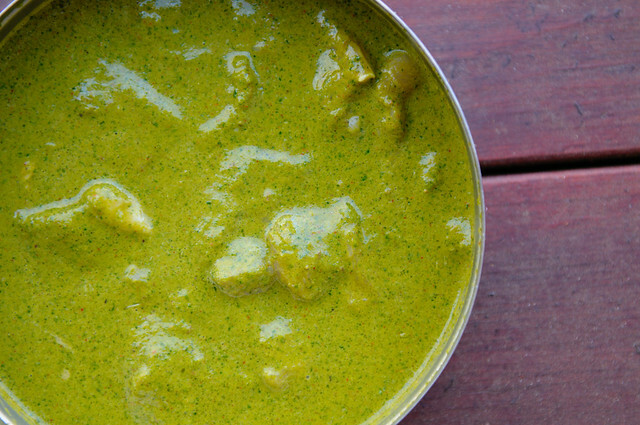 need to try it, for with this green chutney kind marinade, it find it gets runny. Oh, yum! I will have to try these. Do you get Cook's Illustrated? There are chicken kebabs in there that are coated with bacon paste. Though I have visited many places , still have'nt visited north of India. Very nice pictures of Agra Fort. Not every tourist's delight is it ? Very few people seem to be around. Heguiberto, I know it will work very well with paneer. You can make your own or find it at an Indian grocers. If you do try it with tempeh or tofu, please let me know how it worked for you. I hope you get to visit India soon! Ameeta, thanks! Agra is intriguing. We spent about 2 days there and made the most of it! GB, thanks! I hate to discard marinades and look for ways to use them. Every part of our trip was well worth it! Soma, it was rather pleasant in December and we were wearing light fleece jackets except when we were in the blazing sun. Besan helps the marinade thicken and coat the meat. It also gives the marinade a creamy texture. Try it! Kitt, these are super easy! I don't get Cook's Illustrated but bring your copy with you when we meet so that we can all drool over them! Sumi, if I had had my way, we would have gone south instead of north but since neither Medha nor my husband had seen the Taj Mahal, we visited the Golden Triangle of Delhi-Agra-Jaipur. I hope you get to go soon! Bong Mom, it was actually very crowded! I waited and managed to get some shots in as groups of people moved out together, making it look deserted. Agra Fort is over 90 acres, not all of it accessible, so the crowds are more dispersed than at the Taj. Your girls might like the kebabs as they aren't spicy. Oh, how my mouth watered as I read the marinade formula- absolutely splendid! I loved the pics - both of Agra fort and the Taj Mahal. I must also say that of the tons of pics that I have seen of both places, yours are some of the nicest! Thanks also for awesome recipes with both posts. I am now seriously considering buying 'Prashad' - it looks like a must have for the indian carnivore. Besan in the marinade...what a stroke of genius! Pel, it is! There is no need for any heavy cream! The tikka looks juicy....super yum pics. Although we all know that the truth always triumphs and its not possible to hide the truth, I must say that in your photographs of one of the 'Wonders of this World',... 'Wonder' is less and 'Worry' more....you have highlighted the few black drops in the whole beautiful 'White' paper...Being a proud Indian, I wonder WHY??? Indu, India is beautiful and so culturally rich. I don't think we will be able to do more than scratch at the surface in our lifetime! Anshu, these are my pictures, my stories and my posts with my perspective on my blog; the operative word being my. If none of it appeals to you, feel free to use that one powerful click to close the window and navigate away from my blog. 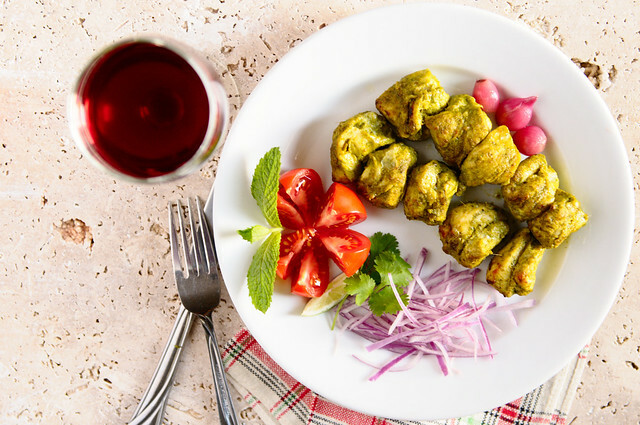 Love that you added yogurt to the marinade for these kebabs. Thanks, Manisha, for pointing me to this recipe! I know my husband is going to like it, too!